According to Global Care Rx, their goal is to help people with no insurance policies to obtain and continue their medications at the lowest price possible. As a global company, Global Care Rx adheres to policies and it includes asking for a prescription before dispensing prescription medicines. Global Care Rx started operating in 2009. For nine years, they have been operating with the best interest of their customers in mind. All medicines offered by this online pharmacy are CIPA licensed and Pharmacy Checker verified. As for their website, it is encrypted with 256-bit SSL security to ensure that your data is safe from hackers and scammers. With this security, you can be sure that your information will be acquired by marketers. Ordering from Global Care Rx is easy. You just have to create an account on their website. Once you created your account, refilling your prescription would be easier as their contact center can just refer to your information on your next order. Rest assured that your private information will be used for ordering purposes only. The maximum order is up to 3-months’ worth of medication. International orders are expected to be delivered within 4-6 weeks after. Guaranteed delivery is offered by this online pharmacy and if after 30 days since shipped, if your order has not arrived yet, you should report it for investigation. If you are a returning customer and is ordering for a refill, you should order your medicine at least 4 weeks before your stock runs out. Regardless of the amount of your order, there will be a flat rate for shipping fee, which is $9.99. What do they offer? You have to enter the name of the medicine you need on their main page. Once you find your medicine, check the dosage and the number of pills you need. Before making a payment, send a copy of your prescription via fax or email and once verified, you can proceed with payment. This e-store accepts credit card, e-Check, personal check, money orders, and bank transfer. For the last 9 years, Global Care Rx has been serving its customers with honesty and reliability that only Global Care Rx can provide. According to their page, they have happy customers because they have good offers and they have a 100% price match guarantee. To check this, we decided to read some of their customer reviews. We found four customer reviews for Global Care Rx. The first comment is from a sad customer because her or his area is not served by Global Care Rx. The customer is residing on the East Coast of USA. The second review was from a customer residing in California. Linda said that she saved a lot after ordering from this online pharmacy as compared to what she used to pay with Walmart. Linda said that she used to pay $357 for her blood pressure medication but with Global Care Rx, she only had to pay $20 plus the shipping fee, which is $9.99. In addition, she only has to wait for a week for her medications to arrive. 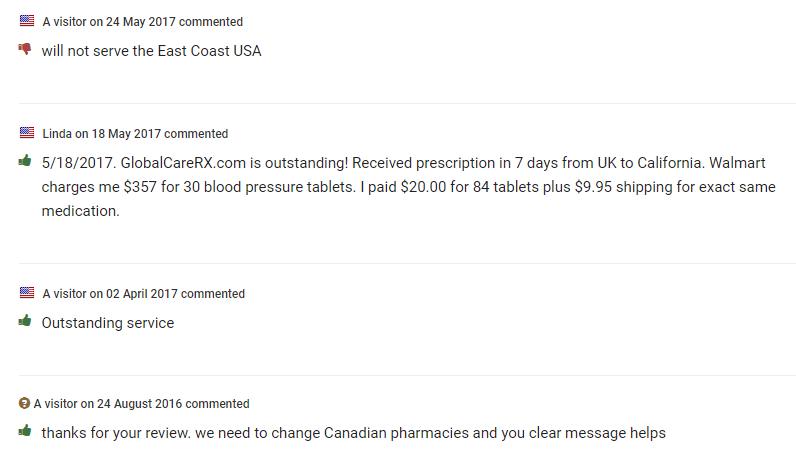 For the third customer, the comment left for Global Care Rx was excellent while the fourth customer said that he is now changing from a Canadian pharmacy to Global Care Rx. With these reviews, it looks like Global Care Rx is indeed a good option when it comes to affordable medications online. Ordering from Global Rx is easy. They do not have a list of available medicines on their website and you need to type in the name of the medicine that you need before you can order it. Once searched, you can proceed with the order. First, you have to click on their ‘how to order’ page. It will give you options on how to make your order as you can make it via phone, online or mail. Faxing your order is also possible. Once your order is received, they will notify you of the amount to pay. You can pay with your credit card or bank transfer among other options. Once the payment is received and verified, you will have to send your prescription to their contact center to verify. Upon verification, your order will be shipped to you and your credit card will be charged. In their policies, it says that all orders should have a confirmed payment before it can be processed. If you have questions regarding the ordering process, you can contact Global Rx at 888-487-3440. You can also send them a fax message at 888-886-5803. These lines are open on weekdays from 5 in the morning until 12 midnight. On weekends, these are reachable from 5 in the morning until 8 in the evening. You can also send your queries or issues to Global Care Rx via mail. Their address is Global Care Rx, 7-B Pleasant Blvd, Suite 1083, Toronto, ON, Canada. Finding a reliable online pharmacy that offers cheap medication is challenging because there are thousands of them online. Even illegal online pharmacies look legit and they have designed and offers that will definitely lure you. Before picking a store to trust, always verify and check backgrounds. You can also refer to our list of recommended online pharmacies for more options.